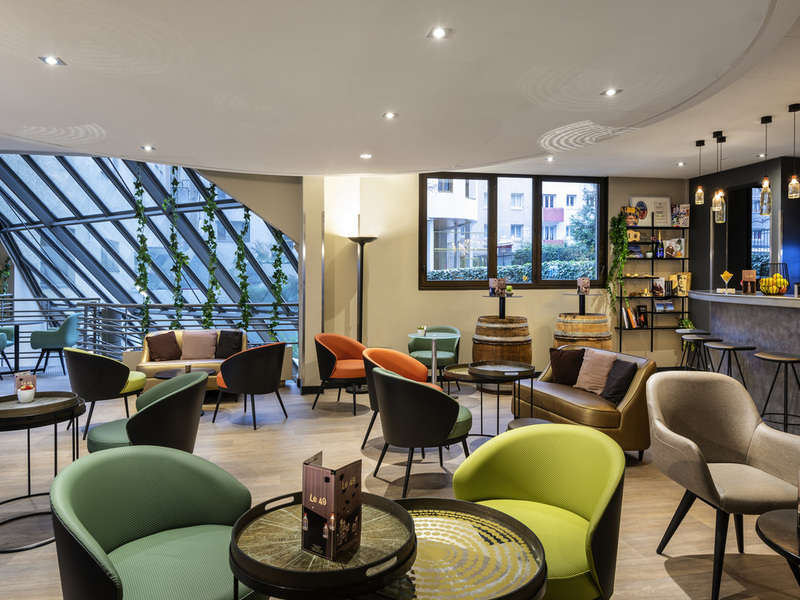 ibis Paris Alésia Montparnasse Hotel is located in the heart of Paris, 3 km to Porte de Versailles, 5 km to the Eiffel Tower, and 15 km from the airport. The fully renovated hotel has 264 aircon rooms with WiFi, incl. 7 for reduced mobility guests. The 'Le Jardin des Plantes' restaurant, the 'Le49' bar for 24/24h snacks, and private covered parking are available. Animals accepted. Eight 8 meeting rooms. The gentleman at Check-in was very polite and welcomed us despite arriving after 11pm. Unfortunately, very early the next morning, we were woken up by loud hammering and construction noise from the rooms below. We eventually had to get out of bed and check out early. At Check-out, we mentioned the hammering noises to the receptionist. She seemed unbothered and simply responded by saying the hammering had started after 9am. Regardless of whether the hammering started at 9am or before 9am, I just found the experience unpleasant. My pregnant wife and I were on holiday and we would have liked the opportunity for quiet enjoyment of sleep in the room we paid for - regardless of the time. Everything was ok, i can recommend. Everything was ok, great location, a lot of shops around the hotel. Very nice personel. Good as expected but the only bad point was the heating/AC system that was inoperated. We turned on the AC to cool the bedroom but all nights are hot as hell. Liked the restaurant option, which I used for lunch on Friday; shame it was not available over the week-end. Nice bar area and room to relax. Breakfast was good, nice choice; shame the croissants ran out on Sunday morning! Good value. Room - OK, but the bathroom is very small; the sink did not work properly and I could not get this fixed - #420; and the bathroom door handle was not functioning as it should. I have been staying in various ibis hotels over the past few months and I am never rewarded with fidelity points. What is hapening? I always ginve ny Accor card when booking. does it mean that I am rewarded only when I am booking direct? The hotel has a good location, 7 minutes walk to train station. It has great grocery store and eatery shops nearby. The hotel room is a bit cram and it’s below our expectation. The 2nd door is not working properly and on our 1st night it was spoilt and we have to transfer to the other room. There were toiletries provided but there were no basic items like kettle, slippers and bathrobe. We have travelled multiple times and have stayed to different hotel groups but this hotel is just a normal and it has less amenities than others. The hotel staff are helpful and check in/check out was fast. There were no welcoming drinks/water. I guess it’s just really a plain room. Everything - almost - is good about this hotel. However, there were rooms close by where guests were smoking, and this seeped into our room everyday - we had to air the room each day at night. Very annoying.Both the toilet and the basin were cracked, and the drain hole did not work in the basin. The temperature in the building was so high we couldn’t sleep at night. We opened the window and turn off the heater but we were still sweating and it’s something that is not acceptable from this hotel. Too hot, and not so hot. This hotel was not our first choice. When we arrived desk clerk seemed to be confused as to our instructions and had given away the room we requested. But he did provide a room with a bath which we asked for, which was nice, although room was a bit shabby. However the heating in the room was far too hot, and is controlled centrally, so we could not switch it off. We didn't expect to be sweating in November/December! Too hot to sleep so requested room change at 1am, which night porter sorted out, he put us in a refurbished room, which looked very nice, but was just as hot as the first one! We had to sleep with the window open and outside was very noisy, with people having screaming arguments and trucks parking. We got no sleep, so our plans for the start of the day were ruined. In the morning we complained to the desk, and was confronted by a very rude man who dismissed our concerns and seemed like he wanted to pick an argument with us, even though we were as polite as we could be under the circumstances. All the other staff seemed really nice, it was just this one guy. We asked for the manager, who happened to be there, and he came up to see the room. He explained that the heating could not be turned down. He claimed some customers like the rooms to be really hot. I cannot imagine who finds this room temperature comfortable. Although it was Nov/Dec, it was mild weather, 12-16 degrees outside (and much hotter in the room!) However the manager kindly provided us with a fan, which worked well, although it seems ludicrous to have a fan running and heating blaring at the same time. We don't know why this central heating system is necessary, seems it would be easier to take it out and put air conditioner units in, as in other Ibis hotels. Then the person paying for the room, could actually decide what temperature they want it to be! When we returned to our room after visiting reception, we were locked out. We thought it was a problem with the cards, and went down to speak to the rude man again, who scowled at us and reactivated them. But we still couldn't get in the room. Luckily the hotel handyman who was delivering our fan arrived at that moment, and his master card didn't access the room either! He then worked out the door card lock had stopped working, and managed to fix it. After all this comedy of errors, we settled down to the hotel, although we were still recovering from the lack of sleep on the first night. I liked the new room design, and the room was cleaned very well every day. But the first day or so really did put us off this hotel. The shower was nice and new, but the extractor fans in the bathroom didn't seem to be working at all, so it got very steamy. On the last night we were there, the wifi wouldn't log in. We were assured by reception that the engineers would fix it within 2 hours, but it wasn't fixed the next morning before checkout at 12. I had to go over my data allowance to get on the internet. It was also annoying that this hotel only had luggage lockers that you have to pay to use. It wasn't expensive, but all other Ibis hotels we have stayed at will just look after the luggage in a secure room until we picked it up. As I said, we have stayed in a lot of Ibis hotels around Europe, and this one was by far the worst. But if you like your room heated up like a volcano, it is very handy for the metro. Hotel is clean and new. Staff is efficient and young. Did not try the breakfast or bar. Problem with the heating system which is always too hot, meaning that the window must be left open. Great location to do business near Montparnasse area. Check in/out were fast. Prices were OK for Paris. Comfortable one nights stay in recently refurbished Ibis hotel. Convenient location near shops and restaurants not far from Metro and Tramway. Compact room but comfortable for short break not far from the centre. I checked in online and when I got to the hotel, everything proceeded smoothly. The hotel was comfortable and clean and staff friendly and helpful. The breakfast was good though lacking in variety. The first room I was given had a strong smell of smoke like someone had been smoking in it. The housekeeping lady tried to help by spraying it and I opened the windows. I later on went out but when I came back the smell was back again/still there. This was odd because the rooms are &quot;no-smoking&quot; rooms. I guess the problem must be in air circulation system, this needs to be checked out. Any way the guys at the reception changed for me the room and the rest of my stay at the Ibis Alesia was great and comfortable. Its a bit of a distance from the Metro station but its a small good walk in a quiet neighborhood.